I’m not sure where to begin. I could go back to camping. That amazing 2-days my husband, Dave and I spent in Maine, creating our beautiful daughter. It wasn’t really romantic, but it got our minds off of the previous 6-week troublesome time, which began with an early pregnancy miscarriage- often referred to as a chemical pregnancy. In the weeks following, when the cramping eased, and the doctor reminded me that we could try again right away, we knew we needed a weekend away. With our handsome puppy at doggie daycare, we took off to Wells, Maine. It was a beautiful weekend. And we made Addie. A few weeks after we got back, I got a faint line and after watching the timer flash for 3 minutes “PREGNANT” popped up on the digital screen. Excited, but scared to repeat the past, I tried to hide my findings from my husband; but, a few hours after he went to work, I texted a picture of the test to him. Hearing her heartbeat was the most beautiful music ever created. Rapid and deep, hearing her life beginning in me was one of the best days of my life, and over the following months, I took the tests, ate well, gaining only 26 pounds, and was then blessed with a beautiful, but long, delivery at 38 weeks, 5 days. 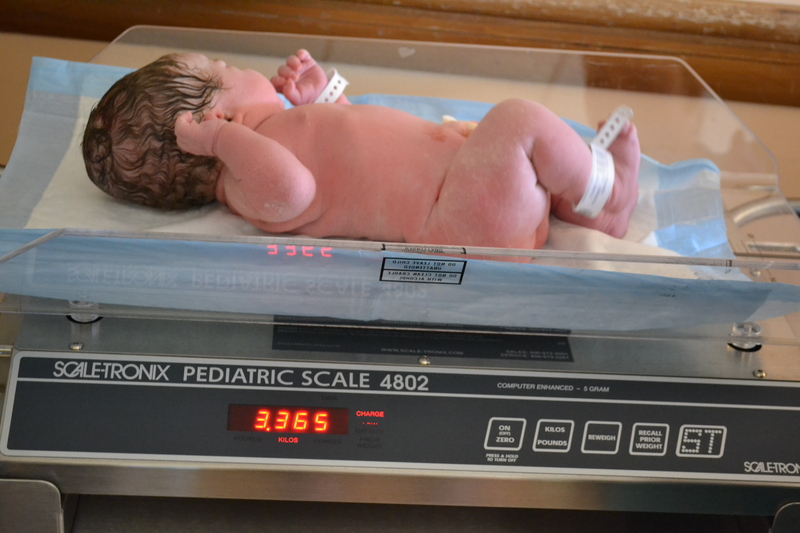 A clear-lunged Adelaide Eileen came into the world April 17, 2012 at 10:32am at 7 pounds, 7 ounces and 18 inches long. 18 inches is in the 5th percentile for height in a newborn. At Addie’s one month check up, her head was in the 75th percentile, weight 10-25th percentile and height still in the 5th. 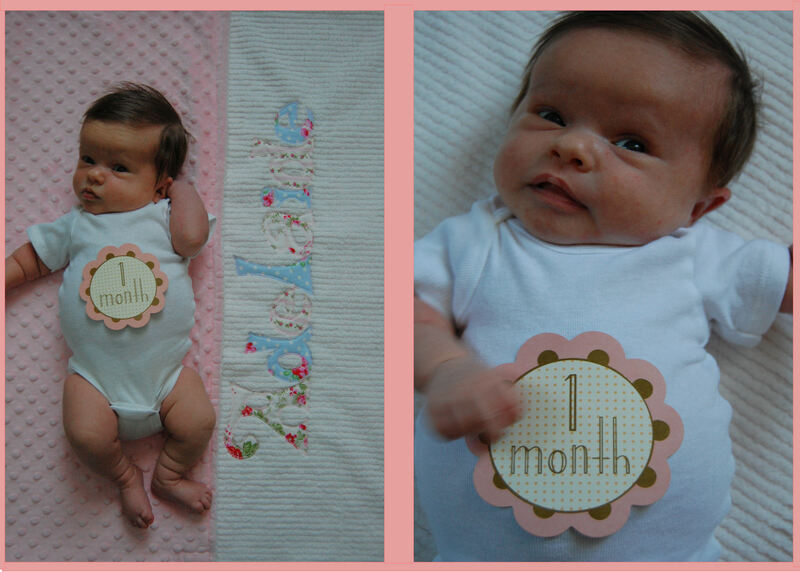 At two months, her head was in the 90th percentile, weight 25th percentile, and her height had dropped below 5th. We left the doctors’ office with an appointment for a fontanelle ultrasound to check for Hydrocephalus and another for x-rays of her long bones. At 5’7 and my husband standing 5’9, I was unsure how we had such a short baby, but her head was our main concern. Along with the appointment at the radiologist’s office, Addie left the office with thighs sore with vaccine shots. Later that night, June 19, 2012, a fever of 101.5 struck, and was just the beginning. At 7pm, June 21st, we arrived at Hasbro Children’s Hospital in Providence, RI. Addie presented with a mild-grade fever, lethargy and a lack of appetite. She endured hours of IVs, needle pricks, blood draws, a CT scan and four, yes four, unsuccessful attempts at a lumbar puncture. Without the spinal cord fluid needed to run a meningitis test, Addie was started on broad spectrum antibiotics for the night. A tentatively negative read was done of her CT, for everything, including Hydrocephalus- a concern due to the rapid growth of her head. Although this brought relief, there was another test we knew needed to be done for her general heath (an x-ray of her long bones), and there was the issue of what was making her ill at the present moment. A call from our pediatrician to the attending physician in the hospital prompted the bones of her body to be x-rayed, specifically the long bones in her arms (upper) and legs (thigh), pelvis, spine and skull, which took all of 10 minutes and we were wheeled back to our room. A geneticist came to do some measurements. I felt hot and sick. There were tears forming, but, as a mother, I had known Addie was too short for her age. We discussed nothing specific, only mentioning that there could be a genetic anomaly, and that’s why she was called in to look at the x-rays. As the doctor left the room to read the x-rays herself, I held my knees to my chest and practiced breathing. When she returned, I was cleaning out my breast pump pieces in scalding water. She pulled a chair up to talk. I stayed at the sink, burning my hands in the water. When she didn’t continue her diatribe, I knew the x-rays had shown something. I finished washing the bottles and made small talk. If I never heard what she had to say then she had never said anything. Right? “After reviewing the x-rays with the best radiologist in Rhode Island, we have both confirmed the diagnosis of Achondroplasia,” Doctor. “Dwarfism,” I said. Blankly staring at something that wasn’t there. There’s been a lot of discussion over the years about the proper way to refer to someone with dwarfism. Many people who have the condition prefer the term “little person” or “person of short stature.” For some, “dwarf” is acceptable. For most, “midget” definitely is not. But here’s an idea everyone can agree on: Why not simply call a person with dwarfism by his or her name? Being of short stature is only one of the characteristics that make a little person who he or she is. If you’re the parent or loved one of a little person, you know this to be true. But here are some facts that other people may not realize about dwarfism and those who have it. is characterized by short stature. Technically, that means an adult height of 4 feet 10 inches or under, according to the advocacy group Little People of America (LPA). can be caused by any one of more than 300 conditions, most of which are genetic. The most common type, accounting for 70% of all cases of short stature, is called achondroplasia. can and most often does occur in families where both parents are of average height. In fact, 4 out of 5 of children with achondroplasia are born to average-size parents. an intellectual disability. A person who has dwarfism is typically of normal intelligence. a disease that requires a “cure.” Most people with one of these conditions live long, fulfilling lives. a reason to assume someone is incapable. Little people go to school, go to work, marry, and raise children, just like their average-size peers. More than 300 well-described conditions are known to cause short stature in a child. Most are caused by a spontaneous genetic change (mutation) in the egg or sperm cells prior to conception. Others are caused by genetic changes inherited from one or both parents. Similarly, depending on the type of condition causing the short stature, it is possible for two average-size parents to have a child with short stature, and is also possible for parents who are little people to have an average-size child. What prompts a gene to mutate is not yet clearly understood. The change is seemingly random and unpreventable, and can occur in any pregnancy. If parents have some form of dwarfism themselves, the odds are much greater that their children will also be little people. A genetic counselor can help determine the likelihood of passing on the condition in these cases. Dwarfism has other causes, including metabolic or hormonal disorders in infancy or childhood. Chromosomal abnormalities, pituitary gland disorders (which influence growth and metabolism), absorptive problems (when the body can’t absorb nutrients adequately), and kidney disease can all lead to short stature if a child fails to grow at a normal rate. By far, the most common skeletal dysplasia is achondroplasia, a short-limb dysplasia that occurs in about 1 of every 15,000 to 40,000 babies born of all races and ethnicities. It can be caused by a spontaneous mutation in a gene called FGFR3, or a child can inherit a change in this gene from a parent who also has achondroplasia. People with achondroplasia have a relatively long trunk and shortened upper parts of their arms and legs. They may share other features as well, such as a larger head with a prominent forehead, a flattened bridge of the nose, shortened hands and fingers, and reduced muscle tone. The average adult height for someone with achondroplasia is a little over 4 feet. Some types of dwarfism can be identified through prenatal testing if a doctor suspects a particular condition and tests for it. But most cases are not identified until after the child is born. In those instances, the doctor makes a diagnosis based on the child’s appearance, failure to grow, and X-rays of the bones. Depending on the type of dwarfism the child has, diagnosis often can be made almost immediately after birth. People with these types of dwarfism can, however, get medical care for some of the health complications associated with their short stature. Some forms of dwarfism also involve issues in other body systems — such as vision or hearing — and require careful monitoring. Short stature is the one quality all people with dwarfism have in common. After that, each of the many conditions that cause dwarfism has its own set of characteristics and possible complications. Fortunately, many of these complications are treatable, so that people of short stature can lead healthy, active lives. For example, a small percentage of babies with achondroplasia may experience hydrocephalus (excess fluid around the brain). They may also have a greater risk of developing apnea — a temporary stop in breathing during sleep — because of abnormally small or misshapen anatomy or, more likely, because of airway obstruction by the adenoids or the tonsils. Occasionally, a part of the brain or spinal cord is compressed. With close monitoring by doctors, however, these potentially serious problems can be detected early and surgically corrected. Proper medical care can alleviate many of these problems. For example, surgery often can bring relief from the pain of joints that wear out under the stress of bearing weight differently with limited flexibility. Surgery also can be used to improve some of the leg, hip, and spine problems people with short stature sometimes face. Nonsurgical options may help, too — for instance, excessive weight can worsen many orthopedic problems, so a nutritionist might help develop a healthy plan for shedding extra pounds. And doctors or physical therapists can recommend ways to increase physical activity without putting extra stress on the bones and joints. The information runs far and is quite plentiful. In the United States, approximately 10,000 individuals are estimated to have achondroplasia. Achondroplasia affects about 1 in every 40,000 children. However, this number varies, depending on the source. Eighty percent of all little people have achondroplasia. Approximately 150,000 persons have achondroplasia worldwide. The worldwide population of little people is approximately 190,000. And there, my dear readers, are the facts. Please don’t say you’re sorry. Nothing to be sorry about. She is beautiful and we are blessed. She’s a bit small for her age. That’s all. Mention of a TLC tv show hardly seems appropriate, after all, is social media the best judgment or indicator for life’s actuality? Asking if there is anything you can do doesn’t make much sense either, as she is a normal little girl in every way but height. People don’t know what to say- I’ve already encountered that. But if I may be so bold as to make a suggestion, if you don’t know what to say, say nothing. But with all this talk, I can’t say that I’m not scared, or angry, or confused, or hurt. I can say I’m so happy, blessed and in love. Little people live normal life expectancies and can do anything they want. It’s not a disease. She does not need to be cured. She cannot ever do gymnastics. If I said this didn’t hurt me, I would be a liar. I was a gymnast, and some of my fondest memories are swinging my long and lean body around the bars, sleep over camp and long drives to state meets. She cannot participate in other little girls’ gymnastics parties. But, she can swim- and I’m looking forward to mommy & me swim lessons like it’s Christmas day! And here I am. I’m angry. I’m really angry. I’m so ashamed of myself for, potentially, making life harder for her. I am, in my mind, at fault. I want to help her be the strong girl I know she is, but how can I do that when I’m falling apart on the inside? I’m angry this will impact her. I’m angry other children won’t get it. I’m angry that people in her family, at least not everyone, will understand and respect and be “ok” with her stature. I’m angry people may point, laugh, call her names, misunderstand her, and hurt her. I’m angry, damn it. I really am. Perhaps some of my fears are masked by this anger, which I’ve always been so quick to feel, but for now I’ll call it a pure emotion and hope it unfolds well. As I watch her sleep in her hospital bed (crib), she looks like the most beautiful girl I’ve ever seen. She has my little nose and crooked pinkies, and Dave’s ears and lips. She is an angel. She’s a perfect combination of the man I will love forever and myself. Maybe she’s not your ideal baby- but she’s certainly my ideal: happy, healthy, with dimples, bright blue eyes, 10 fingers and toes, sweet baby coos, and a sigh that ends with her collapsing on my chest. In truth, as I write, she is getting better from whatever brought us here in the first place; No fever, less lethargic and eating much better. But she is still here. I am battling with her being sick and getting a lifelong diagnosis that I’m not sure the right way to process. I am dealing with the good news of no hydrocephalus and the shock of knowing my daughter will be physically different from other children. I am scared of my reaction to other parents, when they tell me of milestones their children are crossing, as Addie’s motor skills may be slightly behind because she cannot learn to sit by propping. I am wondering what life will bring to her and how I can make sure she has the best one possible- as any parent does for their child. Over the past few days I have tried to take all the information thrown our way in stride, and remember that some questions will remain unanswered until she reaches a certain age and the universe reveals its mysterious ways. I’ve contemplated if I had known she would be a little person before she was born, would I feel differently… no. I wish I had had the time before she was born to process, as it is hard to shed tears when I’m looking at her beautiful face; but I will let my emotions take their course, rely on the love Dave and I share and the information at hand to be the best parents we can be. ‘A’ is for Adelaide and Achondroplasia. This was incredibly touching and very sweet. You’re a great mother and it shows. I wish you and Addie all the best, and I’m sure she will grow to have all of her Mother’s beauty and vigor. Chel…..as always you have beautifully and poignantly poured yourself out in your writing. Addie is beautiful…..breathtakingly so, and perfect in every way in her angelic uniqueness. You are blessed and so is she…..because you are uniquely perfect and loving parents for her…..the universe knew the match was perfect. As far as emotions go…..and the many layers of them you are having and the many more that will come…..they are pure and true and born of your great love. They will forge your strength and build Addie’s . You will face this as any other challenge and come out even stronger and more loving together. As someone who ecperienced similar stuff in a different day and its own unique way….. I will tell you most people mean,well….but knowing the right thing to say isn’t always possible….so they fumble as their hearts truly mean to convey how much they want to help you by being supportive. It sometimes comes out differently than they mean it to. And yes….there will be those who react bafly….children who have not yet learned tact……and you will learn as.Addie will to ignore them or guide them with Grace out of your realm. Having a lifelong diagnosis is hard….not knowing what will unfold is harder…..but still you are blessed by her presence and she by yours. One last thought….when we say whatever we.can do…..it might mean….if you need to call me at 4 am because you are overwhelmed and need an ear I’m there. It might mean if she needs anything special along the way… I am willing to help research the best place to get it. It might even mean if things are hectic don’t be afraid to ask me to run to the grocery store….. The truth is it might sound like it means I wish I could change it….I feel so sorry……but what it really means.is.there is great love for you all and we want to be a support to you even more than ever. It took me a long time to hear it any other way too….. I love you all….she is perfectly Addie and will be an amazing.human being because she is so incredibly loved…..and this blog is one of the most special things you could have created. AWWW…CHELLEY!!! I LOE THAT YOUR HER MOMMY!!! NOONEELSE WOULD BE BETTER!! YOU GUYS ARE DOING GREAT FROM WHAT I KNOW AND I KNOW YOU WILL CONTINUE TO. SHE IS SOOO FREAKIN CUTE..I THINK SHE LOOKS JUST LIKE DAE..LOL SORRY :- / LOL…I WISH YOU BOTH THE BEST AND HOPE LITTLE ADDIE GETS WELL SOON. I’m so glad you posted on the POLP page and I found your blog. Although we came to LPA differently, I”m still a mother of a little person and fear many of the same things you do. When we found Louba’s picture on Reece’s Rainbow site, I was scared to say yes to her adoption. I didn’t know what to expect (and still rally don’t), but knew there were others who have walked before me and could help and give advice or be a shoulder and an ear to talk/cry/yell with. We didn’t get a list of milestones when we adopted, so we don’t know when she mastered those baby things. But, at 4, she can talk and run with the best of them! She is the life of the party. All of her brother’s ball player friends adore her and she’s the first one they ask for when we get to the park. Your little one is going to move mountains one day because of the wonderful support you are already giving her. Congrats on a beautiful, perfectly made little girl. I can’t wait to meet you and your sweet angel one day in person. I see you wrote this a year ago. Funny, just researching achondroplasia and I came across this. Docs suspect my 2 month old has this, and we have wondered since birth. 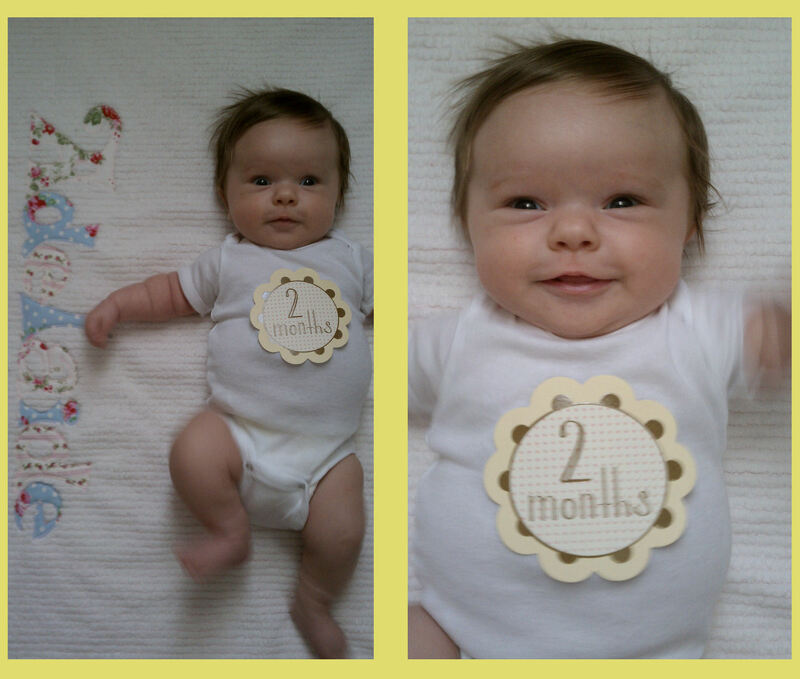 Yep…stats look just like your beauty did at one month and two. We are not scared. We had our 10 year old diagnosed last August with non-hodgkins lymphoma. Now….THAT is scary. THAT needs to be cured. And she is doing great. I found out I was pregnant with my beautiful baby boy a week after my daughter was diagnosed. Ultrasounds before birth did show very very short femurs. My baby looks so much like yours. He is so absolutely adorable and we are not worried about him. He will be fine, just short, and who cares about that? Thanks for your beautiful post! We are loving every minute with our sweetie pie. I wish you so much luck and will pray for your daughter. I am so glad that you found peace so quickly with the diagnosis. As first time parents who had lost a pregnancy, we were certainly scared and guilty about making Addie’s life more difficult. She is just fine- surgeries, spine, apnea, etc… it’s just a few bumps in the road. (If you’re not involved in the POLP groups, please join in! Sometimes questions come up- anesthesia, stools, school support- and there is always someone there to help guide you). and exposure! Keep up the awesome works guys I’ve added you guys to our blogroll.